The fashion industry in New York City employs 165,000 people, accounting for 5.5 percent of the city’s workforce. Fashion generates nearly $2 billion in annual tax revenue and serves as a magnet for creative thinkers. Central to the connection between fashion and New York City is Parsons School of Design. That’s why it came as no surprise that Parsons was chosen to host the first Fashion Campus NYC, which took place over the July 15-16 weekend on the New School campus. Once again, for those aspiring to break into the industry, Parsons was the place to be. Organized by Parsons and the New York City Economic Development Corporation (NYCEDC), Fashion Campus NYC was a career-building and networking event that attracted nearly 200 interns working in New York’s fashion industry this summer. Parsons was a natural choice to develop and implement this initiative, as a leading institution for art and design education that has trained five generations of fashion’s top talent, including Tom Ford, Marc Jacobs, Donna Karan, Alexander Wang, and Proenza Schouler. 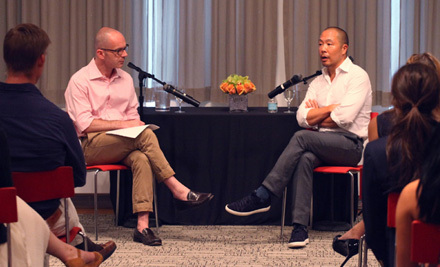 The event featured a conversation with Parsons alumnus Derek Lam and a panel discussion with industry professionals moderated by Simon Collins, dean of the School of Fashion at Parsons. Students also participated in Career Services breakout sessions organized with LIM College and a networking brunch with leading fashion companies. At the event, Seth Pinsky, president of NYCEDC, announced that Parsons has been selected to develop and implement a second initiative, Fashion Draft NYC. Here, a select group of students from around the world will network and interview with top fashion executives, with a chance to earn a management-track position within one of the participating companies. Fashion Campus NYC and Fashion Draft NYC are two of six initiatives resulting from Mayor Bloomberg’s FashionNYC2020 plan to sustain and build the fashion industry in New York. These initiatives address the industry’s challenges in two ways: by strengthening the city’s position as a hub of innovation for emerging designers and for specialty and multi-channel retail and by attracting the next generation of design, management, and merchant talent. For more information about Fashion Campus NYC, visit fashioncampusnyc.com. To receive updates about Fashion Draft NYC, like, the Fashion Draft page on Facebook.